Protecting products using an environmentally friendly bubble wrap packaging is 100% achievable with EnviroBubble from Australian Warehouse Solutions (AWS). EnviroBubble bubble wrap packaging is innovative and 100% degradable and has been designed to break down quickly in landfill, and be absorbed back into the soil with no harmful residues. EnviroBubble has guaranteed air retention, ensuring the bubbles will not go flat and will protect products and goods for their entire journey. 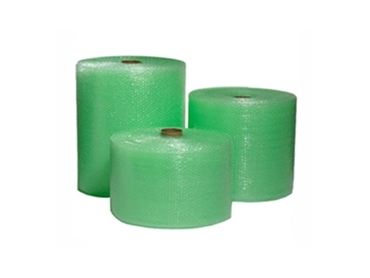 Wrapping products in bubble wrap packaging secures the item in place in a carton or parcel, but also cushions the product from sudden impacts that often occur in transit. EnviroBubble bubble wrap represents the cutting edge in responsible environmental packaging at the same cost as ordinary bubblewrap. AWS is committed to introducing solutions to improve the environmental footprints of their customers.